Start Copy Paste in new Process in The Quad-Directory File Explorer in each file list view! Important! if File Operations is set to New Process the internal Drag & Drop in the same View is not possible! For example: because it has a very convenient ability to drag and drop files in one window. Most often this is necessary for comparing of pictures (arrange the files)! Maybe at this setting, it doesn't work either in newer WinPE builds that Q-Dir does not support drag and drop and copy/paste operations. (Image-1) Start Copy Paste in new Process! 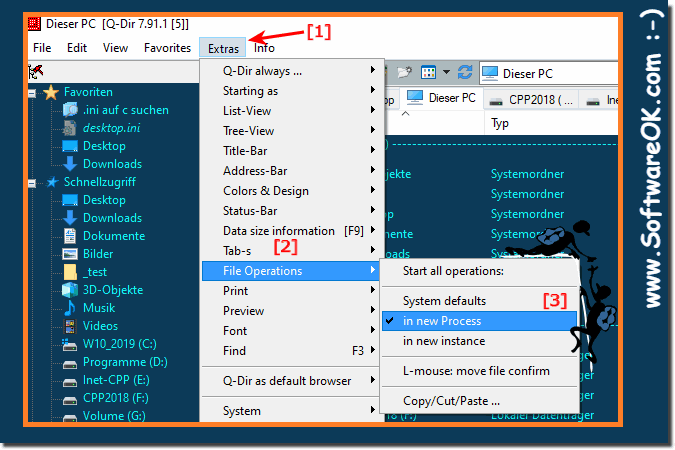 Q-DIR - FAQ-106: Start Copy Paste in new Process (arrange the files in explorer view)! Reset Q-Dir Explorer to defaults as in fresh Install (Uninstall, Autoupdate)! To Show or hide the hidden files and folders in Explore View of Q-Dir, is also possible in the File Manager If you want to change the Settings. I really enjoy using this software. I login locally to the PC and run this software as runas domain account to access my domain pcs. One problem that I see often is that when I am on one computer (\\PC\C$) doing something copying files or something sometimes the entire Program freezes I am unable to do other things. I like to request a new feature that offers. Separate Process per window/box so that each box uses a sperate process to speed things up. Thank you so much for this wonderful program it has helped me soo much in transferring files from one hard drive to other and also between different pcs.? I can not arrange the files freely with Q-Dir. Auto-arrange is disabled but when I try to move a file to another place, I receive an error like "...source & destination are same..." I'm not trying to drag&drop (move) to another folder, I just want to arrange file icons in that same folder! Note: I have other "disabling auto-arrange" stuff (reg. keys or software) on both PC's but I believe I'm missing a setting, etc! I noticed that QDIR is remaining active after I click the X. When I right click the icon I get the message "Progress Dialogue is running. QDIR is in waiting status. If you want to prevent this, click Cancel." Any ideas?